Intoduction M&A activity in the new competitive milieu by Ulrich Steger, IMD Faculty Short introduction explaining why complex cross-border and cross-cultural M&As have been so cyclical in the global arena. It tries to identify the drivers, especially in the last boom of global M&As, and analyses some of the implication for regulation and market results. Chapter 2 Institutional factors in cross-cultural M&As by Paul Strebel, IMD Faculty This chapter examines the need to focus on institutional details instead of national or corporate cultural cliches. The role of institutions and values, beliefs and behaviour will be explored. Dangers inherent in cultural cliches, with the experiences on both sides of the DaimlerChrysler merger, will be discussed. Examples from other companies illustrate how to successfully apply an institutional perspective to different levels of activity. To succeed, companies have to manage cross-border institutional risk, capitalize on institutional diversity and consequently walk the global talk. PART II: How to think strategically about M&As Chapter 3 Mergers of equals: The case of AstraZeneca by Peter Killing, IMD Faculty Is a true mereger of equals possible or is one party always goint to dominate? Senior managers at Astra and Zeneca claim that they have created a successful merger of equals in the pharmaceuticals industry. This chapter-length case study examins the various aspects of a merger of equals the activities of Astra and Zeneca. Chapter 4 Are mega-mergers about creating value? by Piero Morosini, IMD Faculty The real competitive advantages from M&A activity are not the oft-quoted “value creation”, “synergy” or “market power” but those based on the combined knowledge assets and social capabilities of the mergerd companies. Therefore the central strategic issue for these complex mergers becomes how to rapidly combine these assets and capabilities across cultural and organizational boundaries, and this will shape and influence all other value-based, synergistic and/or market power considerations. PART III: Financial aspects of M&As Chapter 5 Valuation in M&As: Art, science or hubris? by Stewart Hamilton, IMD Faculty It is well established that many, if not most, M&As fail to achieve the shareholder returns anticipated and often promised. There are many reasons for this, but often at the root is a failure to value the acquisition target properly, particularly when assessing the synergistic benefits. Making realistic assessments and setting expectations accordingly is especially demanding in an international context. This chapter explores how some of the most common mistakes can be avoided and reveals, more alarmingly, that the proportion of the price determined by management hubris rather than fundamentals is also a problem. The dot.com era, with its “bandwagon” side effects, highlighted this phenomenon, but it has not been restricted to new economy companies. We look at a number of examples from a wide range of industries where faulty valuations have led to disappointment, and in some instances, complete disaster. Chapter 6 Strategic and financial issues of “reverse mergers” by Benoit Leleux, IMD Faculty At all times, regardless of economic conditions, growing companies have to raise capital to provide liquidity, pay off selling shareholders or issue stock for use as acquisition currency. One way to do this is to obtain a listing on a public stock exchange. A different way to gain a public listing is through a reverse merger/reverse takeover, in which a private operating company merges with/takes over an entity that is already publicly listed. This approach to financing can also be successfully applied to sourcing capital from more efficient international capital markets. The chapter examines most of the reverse mergers of the last 15 years in Europe, providing interesting case vignettes to illustrate the circumstances under which a reverse merger could be the way to gain a listing and raise capital. The mechanics of a reverse merger/reverse takeover transaction are outlined, as along with legal and governance issues. The chapter provides a 2 by 2 framework to analyse the strategic motives behind reverse mergers and the key drivers of performance in each quadrant. PART IV: How to implement M&As successfully Chapter 7 Pitfalls in M&A activity by Jacques Horovitz, IMD Faculty This chapter looks at some of the common pitfalls that make more than half of all M&As fail. Since these pitfalls have proved to be extraordinarily damaging in international M&As in the past, special emphasis will be placed on the global viewpoint. Five pitfalls relate to pre-acquisition conditions, five to post-acquisition issues. By identifying them and proposing some solutions to avoid them, we hope to help you achieve success in your next M&A. The chapter also looks at common reasons as to why acquisitions that should have taken place did not in the end. Chapter 8 Global M&As: Why do so many fail? How to make them successful? by Piero Morosini, IMD Faculty Cultural and organizational differences between the parties during the integration phase of global M&As are often cited as key reasons for the high failure rate. However, recent research suggests that these differences need not be detrimental to the performance of global M&As. On the contrary, if they are sensitively handled they can enhance performance. A number of research cases are presented in this chapter, which also suggests a set of common implementation principles that can increase the chances of post-M&A integration success. 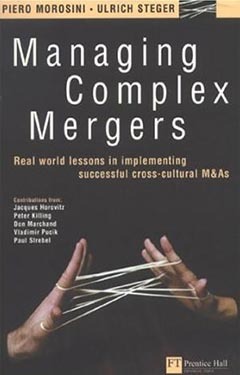 Chapter 9 Getting it right: The human factor in M&As by Vladimir Pucik, IMD Faculty In research on what contributes to the success or failure of M&As, the human factors associated with the acquisition process emerge as critical, especially when the deals span national boundaries. Although the strategic and financial logic behind an M&A will determine the orientation of the integration process, all M&As can benefit if equal attention is devoted to assessing the people and cultural factors – starting with due diligence and lasting until post-merger integration has been completed. Retaining key talent is an essential condition for success in most acquisitions, so this chapter reviews the steps necessary to make it happen. Firms that are successful in acquisitions recognize that they must capture their learning to enhance their ability to execute acquisitions in the future. Chapter 10 Measuring, valuing and managing information, people and IT capabilities: Pre and post global M&A by Don Marchand, IMD Faculty Most managerial attention in M&A work focuses on so-called hard factors such as financial analysis and technology integration. Soft factors, such as information management practices around customer, product and operational information and the way people in the companies use information and knowledge, are considered “intangibles”, beyond the reach of measurement approaches or outside the focus of managerial attention in M&A deals and post-merger integration. Ironically, although these intangibles are an increasing part of what companies are valuing in M&A deals and want to preserve after deals have been signedle guidance or focus on measuring, valuing and managing information, people and IT capabilities in pre and post M&A activities. Addressing these issues is especially demanding in cross-border M&As. This chapter examines how information, people and IT capabilities can be measured and valued in pre and post M&A work and emphasizes how the successful integration of companies requires explicit managerial focus to capture or enhance the business value of these capabilities. The chapter includes the pre and post M&A approaches of two global companies, showing how managers sought to exploit the value of information, people and IT capabilities in their growth strategy and how they evaluated and managed these capabilities in post merger processes. Chapter 11 Challenges of governance structure in international M&As by Ulrich Steger, IMD Faculty In M&As corporate governance can play a dual role: on the one hand it can influence the ease with which these transactions can happen (or highlight the barriers);on the other hand it sets critical conditions for the implementation of the post M&A integration process and the way the expected benefits are harvested (or not). This chapter specifically focuses on governance issues in cross-border M&As since corporate governance principles, norms and legal requirements vary significantly from one country to the next. Appendix Regulatory factors in international M&As by Daniel Neven, Geneva University Faculty and EU Antitrust Commission member (to be confirmed) Monopoly regulators on both sides of the Atlantic have recently blocked a number of high profile M&A attempts. Th apendix highlights the key aspects that executives need to know about this relatively new phenomenon, how this might affect the way we think about global M&As in the future, and what can we learn from recent examples to address antitrust regulations that have suddenly achieved global reach.